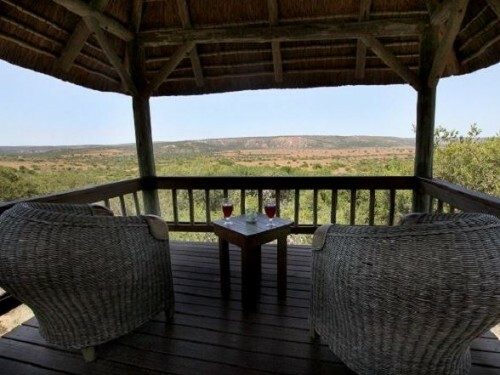 Woodbury Lodge: Four star rated Woodbury Lodge is spectacularly set against a cliff above the Bushmans River valley in the Amahkala Game Reserve. It offers an intimate and tranquil experience of the Eastern Cape riverine bushveld at its best. It is the ideal place for families to relax and enjoy the bush together. Guests are often thrilled by the late afternoon sighting of the elephant herd passing by. All rooms have private decks and large bathrooms with a view over the plains. Child minding facilities available. A range of game viewing and other activities such as the river cruise and bush walks are on offer, or you could just recline around the communal swimming pool and enjoy some sun while the birds keep you company. Unfortunately no under 6 years are permitted on game drives. Enquire from Woodbury Lodge for further details.